His first studio is thought to be an antique coach once owned by Massachusetts Governor William Eustis (1753-1825). Ironically, his parents ensured that young Childe Hassam always had crayons, paints and paper as a child but did not initially encourage his artistic endeavors. (Frederick) Childe Hassam was an American Impressionist painter. His name may be a variant of the old English surname Horsham but he was very much and American painter – his “flag” series is one of his most beloved group of paintings. 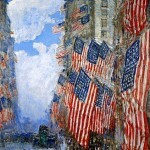 Hassam also painted a large number of cityscapes and landscapes of American, north-east locales. 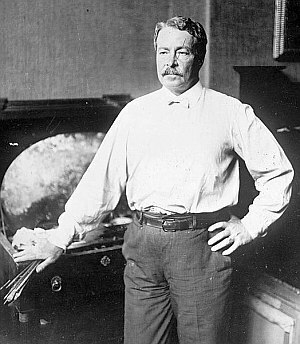 Childe was born in Dorchester, Massachusetts in 1859. An aunt observed the budding artist within her nephew and arranged for him to be tutored by a few local artists. The 1872 fire which destroyed his father's already weakened business and much of downtown Boston led to a reversal of fortunes in the Hassam household. The antiques his father collected, perhaps including the coach Childe liked to use as a haven were sold and by around 1877, young Childe dropped out of high school to find a position to bring money into the household. His first job was in a publishing house accounting department. With no apparent aptitude for numbers, Hassam was let go. His supervisor advised his parent to let him pursue an artistic career since Childe spent more time drawing and doodling than he did with the account books. Thankfully for the world of American art, his parents took that advice and what began as child's play in an antique carriage would lead to the emergence of one of the most beloved New England artists who's career spanned over 50 years. 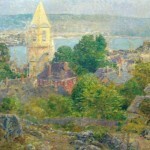 While he did travel, Hassam preferred the northeast and died in 1935 in East Hampton, New York. His work was in fashion and he was able to command fairly high prices. Ironically, near the latter years of his life, the emergence of Cubism, Surrealism and other avant-garde movements led to a decline of his popularity. He works would somewhat fade from view prior to the 1970s when French Impressionism became in vogue and in turn American Impressionists would regain some of the respect they had lost.